While the United States Federal Trade Commission (FTC) has, over the past several years, slowly ramped up its enforcement of non-disclosure for paid (or otherwise compensated) endorsement by bloggers, influencers, and celebrities, their enforcement and oversight is limited to the US. And though social media and the web is global, other countries have not followed this mandate of requiring paid or compensated endorsements to include appropriate disclosure. Perhaps other countries have relied on influencers to follow US laws and regulations since the US is often part of their target audience. Or maybe lawmakers in other countries have felt that other laws intimate the need for disclosure as part of truth in advertising standards. Who knows. What we do know, now, though, Canada is coming on board with requiring disclosure by anyone who is paid or receives compensation in exchange for their social share. In Canada, there is no FTC equivalent. There are plenty of Canadian consumer protection laws, and the majority of enforcement falls on the Competition Bureau. While the Competition Bureau is a law-enforcement government agency, its focus is on ensuring compliance with the Competition Act in advancing consumer protection measures. Neither the Bureau nor the Act addresses the need for or enforcement of disclosure of a commercial relationship between brands and online influencers. This type of oversight has generally been left to the industry and the standards set by Advertising Standards Canada (ASC), a self-regulating, non-profit advertising industry group. The Canadian Code of Advertising Standards (the Code), is a rulebook of advertising self-regulation for all media, including online and social media, in Canada. There are 14 clauses that set out the standards that advertisers must comply with, regardless of the type of media. Specifically, Clause 2 states “No advertising shall be presented in a format or style that conceals its commercial intent.” Seems pretty straightforward, although without the weight of law Canadian citizens are relying on brands and influencers to self-regulate. Which hasn’t been happening. The Code is broadly supported by industry and is designed to help set and maintain standards of honesty, truth, accuracy, fairness and propriety in advertising. The provisions of the Code should be adhered to both in letter and in spirit. Advertisers and their representatives must substantiate their advertised claims promptly when requested to do so by Council. Clause 7 of the Code specifically addresses testimonials, endorsements, and representations of opinion, requiring them to be “genuine, reasonably current” opinions, based on “adequate information … or experience” and “must not otherwise be deceptive”. There’s a lot in that one clause, but it still comes down to authenticity and honesty. The lack of a mandatory disclosure requirement to ensure consumers know the advertiser may have paid or provided compensation to the individual or group providing the testimonial or endorsement is somewhat of a disconnect when paired with Clause 2 of the Code. The Code does not replace the patchwork of laws and guidelines that otherwise regulate advertising in Canada. Instead, it provides a framework for the industry. In doing so, the ASC has relied on advertising agencies and the brands to self-regulate and self-police their online and social media promotions. Unfortunately, the ASC and the Competition Bureau have been dealing with the growing number of consumer complaints regarding non-disclosure by individuals who have been paid to endorse a product or service on their social media channels. And with a growing number of complaints comes a belief that perhaps this type of advertising is not meeting the minimum standards to protect Canadian citizens from unfair or deceptive advertising. So what does all this mean? Until the new guidelines are made public it’s unclear what, exactly, will be required with regard to disclosure. 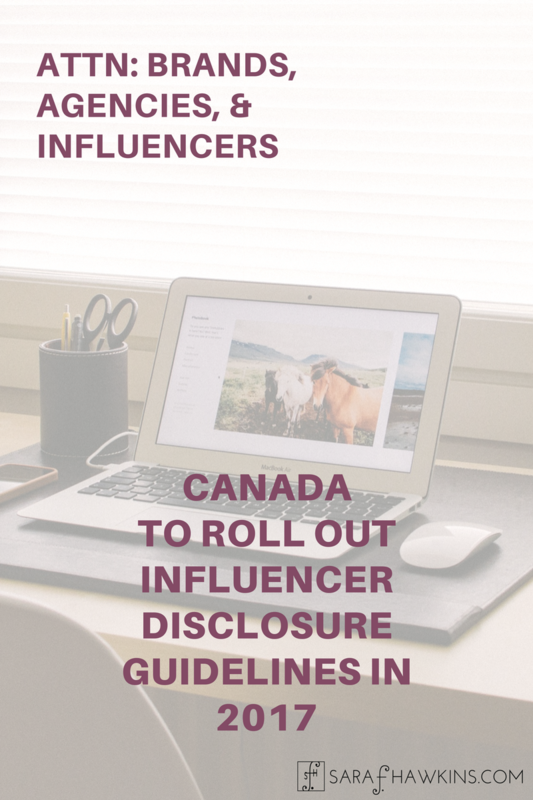 What we do know is that Canada is getting involved with this aspect of consumer protection and it will likely have an affect on how Canadian brands engage with Canadian-based influencer programs. 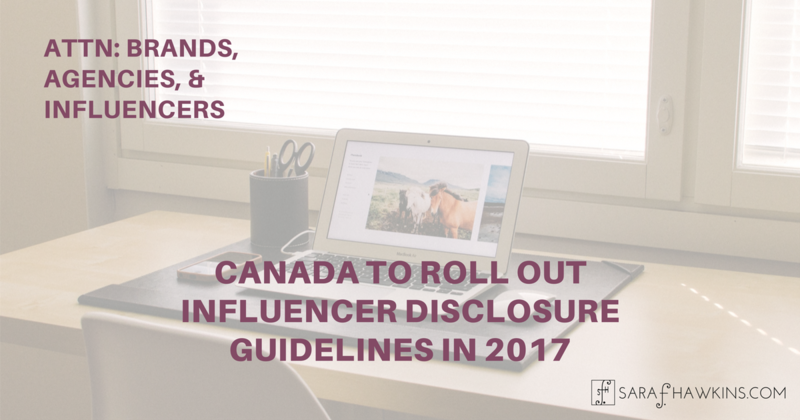 It’s possible that we’ll see an even greater focus on the requirement for disclosure with regard to major international brands because they will no longer just risk having to deal with US regulators but also Canadian regulators as well. 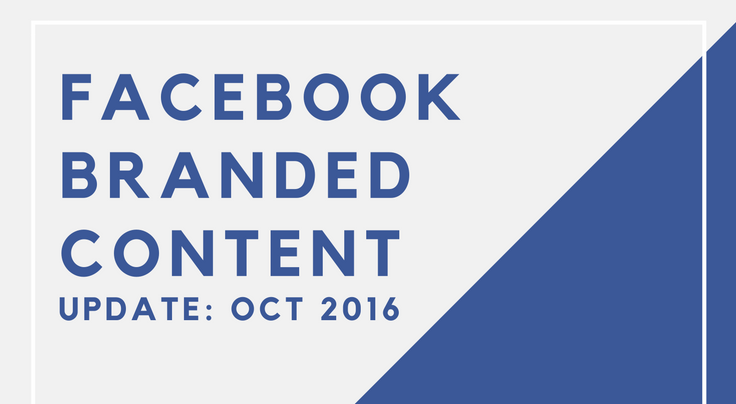 Could we see changes in social media platforms so disclosure is integrated into the post? I highly doubt it. For some platforms, paid promotions in concert with the platform are clearly marked. For others, it’s hard to tell a paid placement from a standard post. Perhaps this new set of guidelines will change that. Is it possible that influencers will go back and add disclosure? Maybe. That may depend on their relationship with the brands as well as if watchdog groups threaten to report non-compliance to the FTC. What I do expect is that agencies will become even bigger gatekeepers between the brand’s legal standards and the influencer’s compliance. Unfortunately, in my work, I am often the one educating the agency as to what my clients can do with regard to platform terms and FTC guidelines. 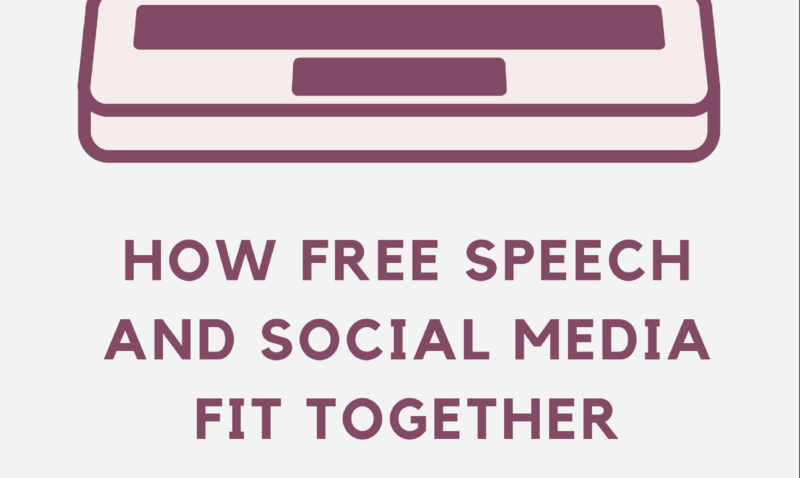 Brands may ultimately be the ones held responsible for violations, but it trickles down. 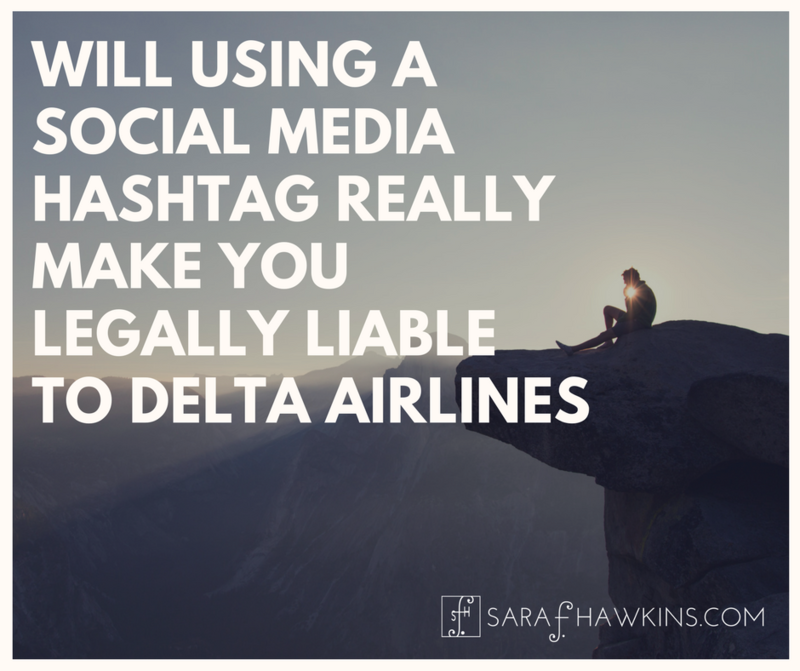 If an agency is not requiring disclosure and ensuring it – whether it be a celebrity, someone who is insta-famous, a blogger, an online influencer, or whatever you want to call the person who is paid or compensated for what they post – likely the brand has a contract with the agency that will pass along any liability. What you need to know is that the rules of paid endorsement engagement in Canada are changing. They’re not changing much, because the underlying principles have always been there. 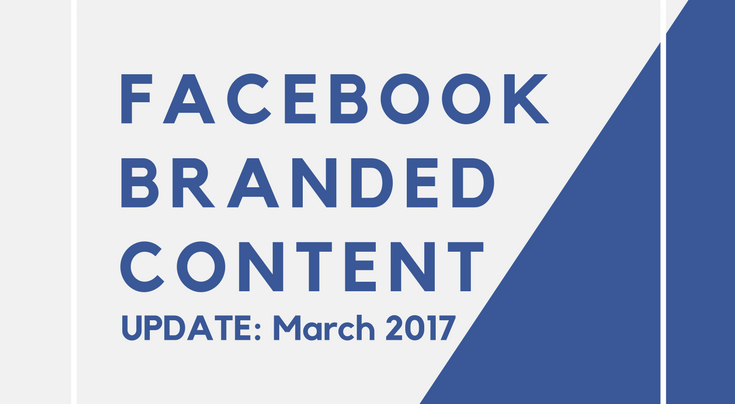 Nonetheless, Canada’s advertising standards will likely be updated in 2017 to require something similar to the FTC’s Endorsement Guides. It’s not as if they don’t already have standards and guidelines, but soon it should be made more clear since The Deceptive Marketing Practices Digest, Volume 1 doesn’t seem to have brought about the level of transparency it expected. Thank you for sharing this! Thus far on my blog and related social media I’ve just been following the US FTC guidelines to be safe, since I imagine Canada’s regulations will be similar.